You are here: Home / Asia Travel Archives / Sri Lanka / Sri Lanka Beaches. Which to Choose? Sri Lanka Beaches. Which to Choose? We’ve posted extensively about travel in Sri Lanka, where to go, how to go, what to do, but we need a post on Sri Lanka beaches to complete the set. Sri Lanka is surrounded by beaches, there are literally hundreds of places to take a beach holiday, from our favourite, Mirissa Beach, to the popular Golden Mile south of Columbo, to the somewhat undiscovered beaches of the east coast, northern west coast, Jaffna and the far north. You will find your paradise, but you need some insider information. Sri Lanka beaches each have their own character and picking the right one for you will help you enjoy your beach holiday far more. Obviously, most tourists stay close to the Colombo airport, people generally don’t want to take a long road or rail trip straight off the plane, but just consider it. 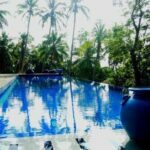 Sri Lanka’s real beach gems are worth the extra effort to reach and transport around Sri Lanka is incredibly cheap and easy. Expect crowds in the south-east, go further afield for seclusion. But lets look at a selection of beautiful and best beaches in Sri Lanka, some will suit surfers, some are safe for children, some have night life, some are secluded and peaceful. Take your pick. Just hover over this image to save it to Pinterest. Thanks! 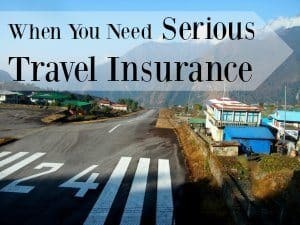 We’ll start near the airport, just north of Colombo and work our way, in order, down the popular west coast, around the southern tip, up the east coast and back down to the airport. For your reference, Galle is pretty much on the southern tip, Jaffna is at the northern tip of the island, the closest point to India and we think, a fascinating destination. There is a wide sandy beach at Negombo, not far from Bandaranaike International Airport and it may be worth taking a look if you spend the night here on arrival. Reviews often include the words “terrible”, “grubby”, “dirty” and “horrible”. I can’t comment, I’ve never been, for beaches we always head due south although an affordable overnight stay near the airport can be useful to get some sleep in, we now use this little hotel every time after trying a few. For all hotels, villas and apartments in Negombo, click-through. Columbo isn’t the place to go for beaches either, it’s a busy city that holds limited appeal and not one we usually choose to stay in although we’ve passed through countless times as we switch between taxi, bus and train in the Columbo Fort area. Negombo ( above) and Mount Lavinia (below) are the closest places to see a beach but Galle Face Green, a strip of recreational land facing the Indian Ocean, is undoubtedly worth a look. For all hotels, villas and apartments in Columbo, click-through. Mount Lavinia has historic charm and is a satellite beach suburb south of Colombo. You will pass through here on the train heading south. Some think of it as the “posh” part of Sri Lanka. 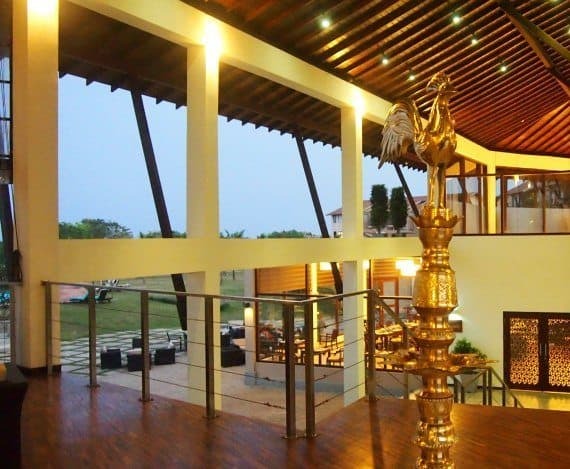 The colonial style Mount Lavinia Hotel, set on a promontory overlooking the ocean is undoubtedly the place to be in Mount Lavinia. 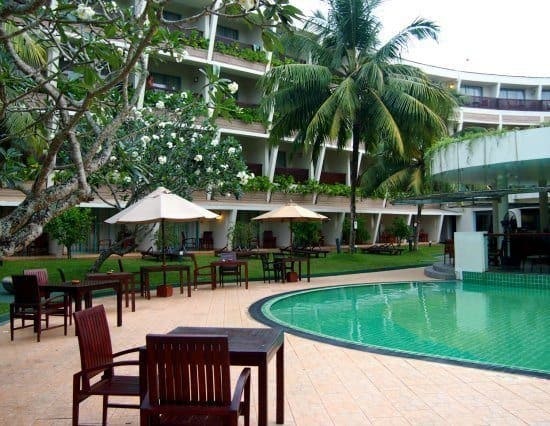 For all hotels, villas and apartments in Mount Lavinia, click-through. For all hotels, villas and apartments in Panadura, click-through. This is the view of Kalutara that most visitors will know. Everyone crosses the river here by rail or road as they head down the coast, often with their driver stopping to offer a silent prayer. The temple at Kalutara is one of the holiest sites in Sri Lanka. 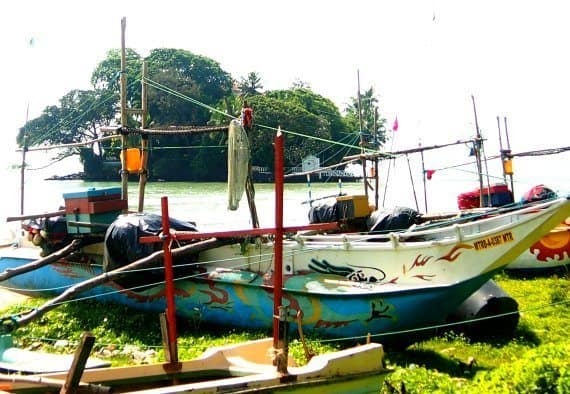 Kalutara sits on the mouth of the Kalu Ganga estuary, the hopping on point for many river safaris. The nearby beach receives very mixed reviews on Trip Advisor. I have never visited other than for river access. For all hotels, villas and apartments in Kalutara, click-through. Beruwela is on Sri Lanka’s Golden Mile beach and it is exactly that, a golden mile of sand. The beach is fairly quiet as many visitors prefer their hotel pools or are out exploring other attractions nearby and in other parts of Sri Lanka. You won’t find the pounding surf here and the beach is far less steeply sloped. There is a netted safe swimming area. The Eden Resort and Spa ( below) is one of the best and most popular hotels in Beruwela and we can personally vouch for it, we had a great stay. The post above gives you full information on the facilities, rooms and food at the Eden. The Eden Resort is right on the beach, set back in beautiful gardens. Recommended. At the southern end of Beruwela beach ( Moragalla Beach) a salt water lagoon claims the shore. From here you can pick up boats to enjoy water sports or lagoon tours. For all hotels, villas and apartments in Beruwala, click-through. The lagoon mentioned above separates Bentota from the mainland and the big hotels are mostly to be found on this strip of land, ocean to the west, lagoon to the east. For all hotels, villas and apartments in Bentota, click-through. 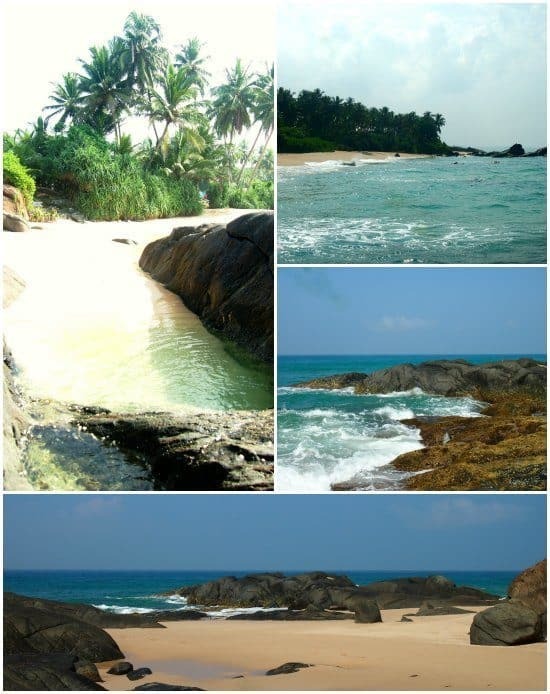 All of these images are of tiny, secluded, Balapitya Beach. If you’d like your own private beach, no tourists to be seen, just a few local kids happy to show you how they dive from the rocks, try little Balapitya. We stayed here for a few days last year in the very lovely Balapitya villa. It was very affordable, the private villa was gorgeous and we just loved our little beach. For small children the rocks for a secret, safe paddling pool full of tiny fishes. Check out our post on Balapitya Beach, or go straight to Villa Balapitya to check price and availability. For all hotels, villas and apartments in Balapitya, click-through. Chef helping local fishermen with the morning catch. Ambalangoda beach. 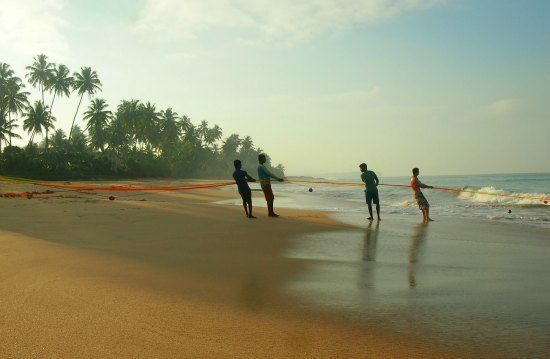 Ambalangoda beach is quiet and at times almost deserted but for fishermen. It was a great experience to stay here and wake up to life going on just footsteps from our villa. There are a number of hotels and villas that open directly onto the beach but they haven’t so far spoiled the look of this place, as you can see above. Ambalangoda is famous for traditional mask making. There are river safaris a short tuk tuk ride away any Galle or Columbo are easy to reach. We stayed at the super-luxurious Max Wadiya Villa, which we highly recommend particularly for foodies looking for cooking lessons from their resident private chef. But this villa is very much “luxury” with price tag to match. For all hotels, villas and apartments in Ambalangoda, click-through. 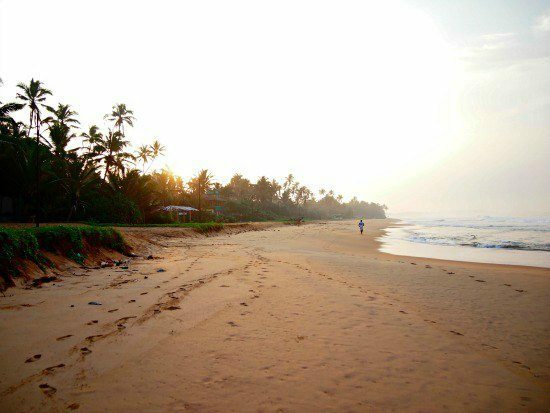 The south end of Hikkaduwa beach at sunrise. But it’s not all like this! Please read. Hikkaduwa was my first love in Sri Lanka, I first visited back in 1998 ( I think!) when Sri Lankan tourism was a far smaller operation. Back them Hikkaduwa was considered much nicer than the big destinations further north because mass tourism hadn’t yet made much of an impact. That has now all changed and Hikkaduwa is a different place to be. The harbour end, near the bus stop and Coral Gardens was over-run with tourists last time we were there (2016) and was none too clean. At this end of the beach you’ll find giant sea turtles being hand fed in the shallows, I’m not 100% sure if this is OK or not. Yes, they’re feeding them sea grass but should they be tamed like that? Whatever the ethics, there will be crowds of people. The coral here is pretty much dead, don’t get overly excited about snorkelling but it is a safe area for children to swim, out of the pounding surf. To the south of the Coral Gardens waves crash on a steeply sloping shore and the surfers rule the waves, further south again, as you see in the photo above, calm returns to Hikkaduwa. I still have a deep affection for this place and it remains the only destination where I’ve ever seen a turtle laying her eggs after dark,, but I want you to know the real story before you book. For all hotels, villas and apartments in Hikkaduwa, click-through. The shore line at Galle is taken up by the historic fort, but there are excellent beaches slightly to the north and south. 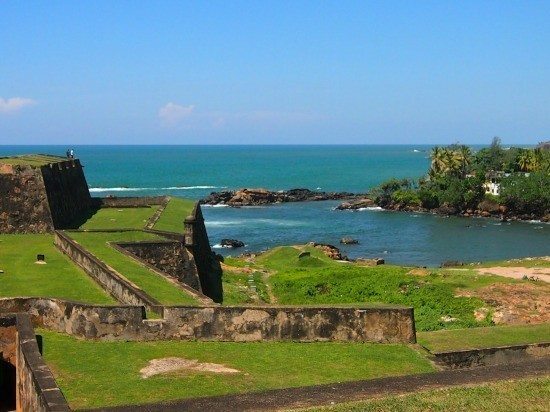 Galle, the southern capitol, doesn’t really have its own beach as the stunning Dutch fort occupies the shoreline, but of course there are beaches immediately to the north and south. Unawatuna isn’t far away at all, maybe 10 minutes south in a tuk tuk. We think Galle makes a great base as the town, fort and markets are fascinating and if you want beaches there are plenty to try. If you’re looking for an up-market beach-front hotel near Galle, try the Jetwing Lighthouse, it’s a place we know and love, we got married there! For all hotels, villas and apartments in Galle, click-through. I can’t find a realistic photo of Unawatuna to share, all the images on Flickr seem to be pre tsunami and could give you the wrong impression. I didn’t take any in 2016. The pretty little bay of Unawatuna is another place that’s grown enormously over the years. It was devastated by the tsunami, but we went back to see how it was today. We were surprised by what we found. The town still has bags of charm, narrow roads, gift shops and cool places to eat. We liked it a lot more than we expected after hearing tales of new builds and mass tourism. The beach is undoubtedly busy with endless beach restaurants set up on steeply sloping sand but we think it’s still a nice place to stay. On the headland at Unawatuna is a sunset spot where enormous waves pound the cliffs. It’s an amazing place to sit for a few hours and you may appreciate the images I took of an unfortunate bride catching an unexpected monster wave. Further around the headland are a couple of “secret” or “jungle” beaches. They were extremely busy when we visited but it was a weekend and there were a lot of local tourists. 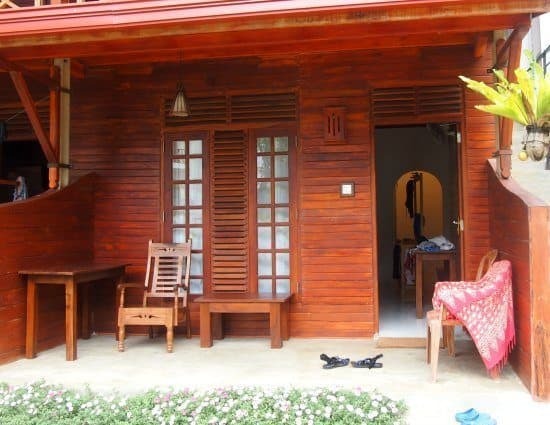 We highly recommend Birdhouse Guest House Unawatuna for their reasonable prices and lovely, modern family rooms. The lady of the house cooks up a mean breakfast too. This place has been here since before the Tsunami and is a family business in the village with great reviews. We found this place because of it’s excellent Trip Advisor standing and were not disappointed. For a beach-front hotel with pool at Unawatuna, you need the Calamander Unawatuna Beach or Cantaloupe Levels. For all hotels, villas and apartments in Unawatuna, click-through. Just north of Mirissa, Welligama is a busy town with a large sandy beach. At its centre, the splendidly isolated Taprobane Island makes the bay extra photogenic. Fishermen sell their catch behind the beach every day, this is a fishing town with its own port, not a deserted beach . From here and from Mirissa, you are ideally placed to take a whale watching trip. This is one of the very few places in the world where you stand a chance of seeing blue whales. We went, and saw several, the experience of a lifetime. There are large hotels going up here now, including a new Marriott. For all hotels, villas and apartments in Weligama, click-through. We’ve posted about Mirissa in detail elsewhere. It’s our favourite of the Sri Lanka beaches and we return time and time again. Read here Mirissa, Paradise Found and Family Accommodation in Mirissa Beach. We highly recommend Celestial Inn, for up to 3 person budget rooms, comfortable and in a relaxed garden setting. 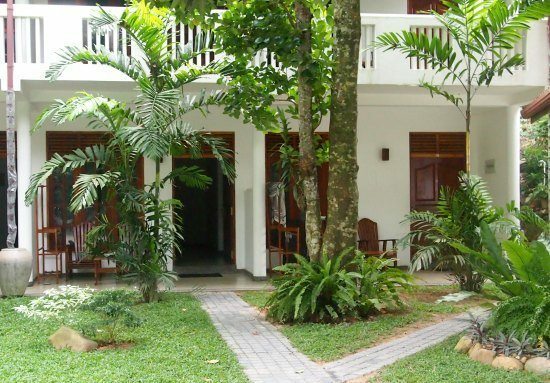 Celestial Inn is on the little river that runs through the heart of Mirissa village, just a very short walk from the beach. For a 4 person family room consider Riverside Cabanas, again in a quite garden setting in the village, superb breakfast included. For all hotels, villas and apartments in Mirissa, click-through. 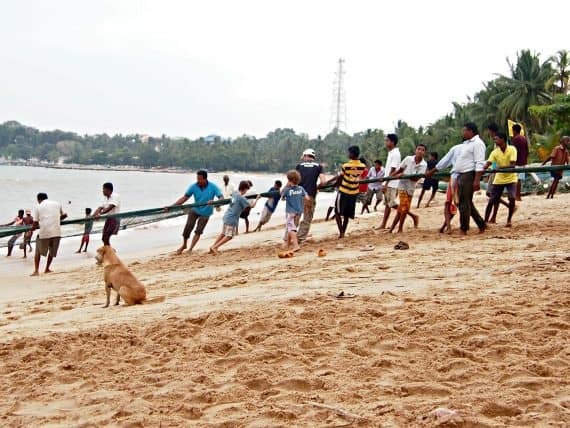 My 3 boys helping fishermen again, this time on Tangalle beach. The steep slope shows how fierce the waves can be here. Tangalle is another beach area where the waves are big and the beach slopes steeply. A sleepy town lies behind the sands and there is a fishing harbour at one end. For all hotels, villas and apartments in Tangalle, look here. Arugam Bay is famous for surf although I hear there is swimming there too. I haven’t been but it was the favourite spot of our neighbours before they were caught there by the tsunami, narrowly escaping with their lives. For all hotels, villas and apartments in Arugam Bay, click-through. We visited Pasikuda for the first time recetly .It’s actually not too hard to get to the northern west coast if you cut across from the Golden Triangle area by road. The Pasikuda bay is lovely and I hear that in season it is clear and calm, allowing visitors to wade out to see the coral. Unfortunately we were there during the story monsoon season ( February) and seas were rough. There are a few large resort hotels on this bay now, not many, as tourism is new here. The new, spacious Calm Resort on Pasikuda Beach looks out towards the famously calm waters. Unfortunately we arrived in stormy weather. 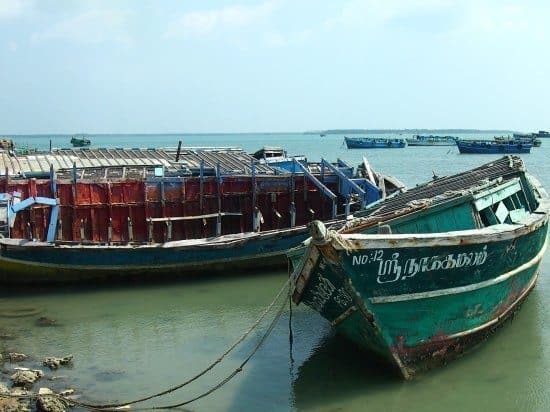 Ferry boats north of Jaffna, the only way to reach the island temples. We love Jaffna! It’s our new favourite but, I have to admit, we haven’t seen the nearby beaches. We’re more cultural travellers than beach goers and we just didn’t get time to check out the sands. The photo above was taken on the bus and ferry ride to the far north to see a magnificent Hindu temple. We’ll be back for the beaches one day soon. 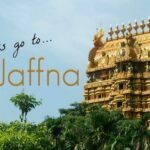 We have a full post on Jaffna here, covering things to do, where to stay, where to eat and so on, just not beaches! For all hotels, villas and apartments in Jaffna, click-through. We’re coming down the west coast now headed south. Mannar Island is fresh territory for is as are all of this coast before Negombo, but I’ve done my research and can tell you a little. Can you book trains and buses before arriving in Sri Lanka? Yes, absolutely you can. There is a site called 12 Go Asia which allows you to do this from your home country. That way you have reservations, everything is paid for and you won’t be disappointed by a full train. 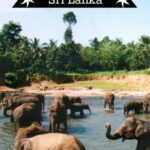 Can you book tours in Sri Lanka in advance? Again, yes. We are big fans of this site for booking all sorts of tours and transfers. This allows you to pay online with your card, have the backup of a big company with guarantees, and avoid local scams, rip offs and haggling. This company also has a lowest price or refund the difference guarantee. Can you pay for many things using your credit card in Sri Lanka? It’s not common outside big hotels and big cities, but becoming more so. Is card skimming a problem in Sri Lanka? Nothing like this has ever happened to us in Sri Lanka during our several months there. Are pick pockets a problem in Sri Lanka? We have never had any problems of this kind in Sri Lanka, but it pays to be sensible. Take a look at a few anti theft travel accessories here. We are heading to Sri Lanka at Christmas and I am having such a tough time picking an Itinerary. The drive times seem really far to take in the best cultural sites, wildlife and beaches. What Itinerary would you recommend for 10 days? That would include some culture, wildlife and beach? We will be A family with a 3 and 6 year old and their Grandparents. We are adventurous travellers but also like a bit of luxury thrown in from time to time. Well Sri Lanka is a really small country so the drive times are great. 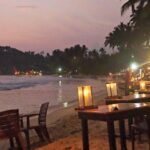 We’re not into beaches much, so we’d check out maybe 1 beach place for 2-3 days on the west-south coast, before moving up through the highlands, Kandy and the historic and cultural sites. I’d ideally stay near Galle, so Galle could be an easy day trip by bus. 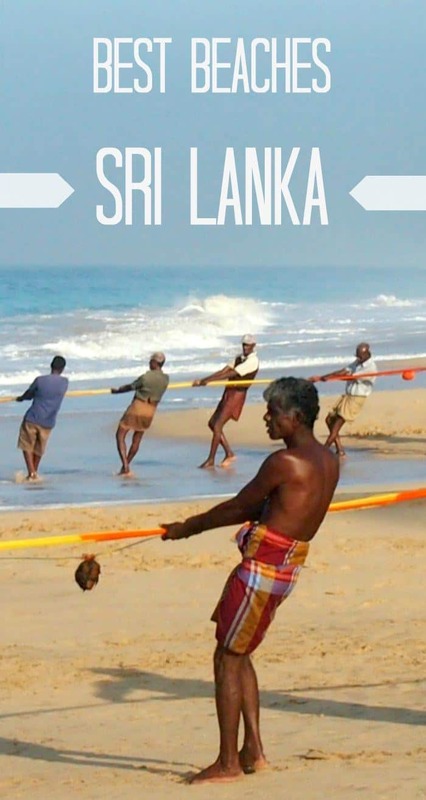 It is wonderful to check out your writings & photos about Sri Lanka beaches. Indeed, Sri Lanka beaches are the best tour destination for beach goers. I would like to add Kalpitiya beach, the popular destination among kite-surfers, Nilaveli beach in east coast of the country and Passikudah another east coast beach. As one of the Sri Lanka beach holiday planner, I am sure Sri Lanka beaches has lots and lots to offer for beach lovers, may be water sports such as surfing, diving, snorkeling, windsurfing, a relax walk under Sun, Sunbathe etc. We’ve been to Passikudah and don’t list it because it was a bit….beach and nothing else, but a nice spot, I’m sure at the right time of year if you like resorts, sun and sand. we were there in monsoon, so sadly didn’t get to see the calm waters and coral. We were just been researching flight prices to Sri Lanka last night! We are definitely heading there in 2017 so this guide was extra inspiration for us! 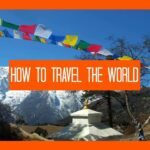 Another place we’re truing to figure out a way to visit is Nepal, it’s more expensive to fly to but I’m guessing the low costs when you’re actually there make up for that?